Here are the top 5 questions to consider when purchasing a particle analyzer. 1. What is the most important particle size range you need to measure? There are particle analyzers that can measure subnanometer to millimeter-sized particles, but no single system can measure all possible particle sizes in one pass. If your samples have a wide range of particle sizes, try to narrow it down to range that is most important. An imaging particle analyzer that can support multiple objective magnifications can characterize particles from 2 µm to 2 mm, where a single objective system might only characterize particles from 2 µm to 80 µm. 2. What do you want to measure and why? If quality control of a sellable product is your top priority, you should chose a particle analysis system that can process samples quickly and provide statistically significant results. If you are trying to determine the composition of a heterogeneous sample, select a system that offers pattern recognition and the ability to post-process your data. Particle analyzers use many different techniques, and knowing what type of data you need will help you determine the appropriate technology for your lab. 3. Are you only interested in particle size, or is particle shape also important? Many particle analysis methods, including volumetric-based systems like light obscuration, laser diffraction, and flow cytometry, can only measure particle size. The particle measurement with these techniques are based on a signal proportional to the particle’s volume, which reports the equivalent spherical diameter (ESD) of each particle. If some of your particles are not spherical, they may not be detected, or their volume will be mis-calculated. If particle shape is important, you should consider an imaging particle analysis instrument. 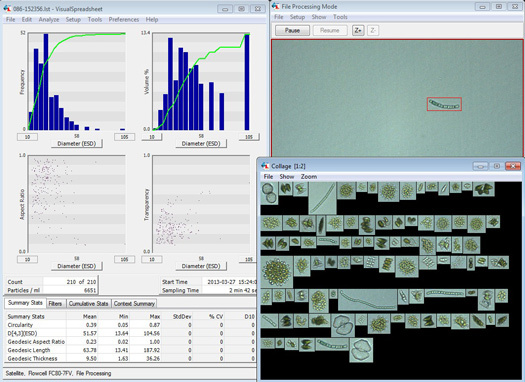 Dynamic imaging particle analysis captures real,optical images of the particles, and can extract a variety of morphological properties from the image of each particle. 4. Is measuring the count or concentration of particles important? If knowing an absolute particle count, or a particle concentration is important, then some techniques will be eliminated immediately. Any “ensemble” methods, or other methods that recirculate the particles can only be used for relative comparisons, not true concentrations. If concentration is important, make sure that the manufacturer has a well-established procedure for verifying concentration measurements (through the use of standards, for instance). 5. Will sample preparation be needed? Often measuring particles in their native state may not be possible. For instance, a slurry of particles with a high percent of solids is difficult to measure with most techniques. When dilution is necessary, use a diluent that's inert to the particles in your sample so it does not alter them in any way. If your sample material is a dry powder, measuring them in a dry state is not always the best method. There can be benefits to suspending the dry particles in an inert liquid for analysis.